Mega Brother Naga Babu's Daughter Niharika Konidela has debuted through this decent film. Rama Raju is the director and produced by Madhura Sreedhar under his production house Madhura Entertainements in association with Channel TV9 with Sunil Kashyap's musical scores. The film's cinematography has been provided by Rami Reddy. 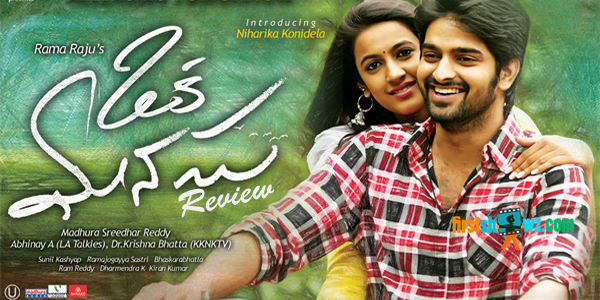 Read Oka Manasu Movie Review below. Sandhya (Niharika Konidela), a doctor in profession works in a Government Hospital falls for young politician Surya (Naga Shourya). The duo spends their love life happily and Sandhya who is not interested in Political Career of Surya asks him keep an end to his political career. When everything is going on smooth Surya will be irked in huge scam which leads him to go Jail for the next three years. What happens to Sandhya? Will Sandhya meet Suriya is rest of the story. Naga Shourya gives decent performance with matured acting through out the film. His role turns to be the major asset till the end. Niharika Konidela justifies with her decent debut through this film and she has eyed to perform only identified role rather than a skin show. She looks so traditional and gives impressive performance through out the film. Rao Ramesh gets another crucial role in the movie as a Politician and supports Naga Shourya in key scenes. Vennela Kishore has nothing much to do in this film except for a few laughs. Oka Manasu movie has a decent back ground score by Sunil Kashyap and the music lets down due to slow moments in the film. Cinematography by Rami Reddy is neat and the visuals are eye feast in most of the scenes. Editing is crispy and could have been better. Director Rama Raju should be credited for the roles given to Naga Shourya and Niharika to perform through out the movie with thier decent roles. Though everything is going on his way, the screenplay looks boring due to slow narration. Oka Manasu is only for the one who loves slow and steady proceedings. The film's first and second half proceedings go on slow pace with no twists and turns in the screenplay. Apart from the scenes between lead pair, the film has nothing to do with story due to lack of commercial elements.